Few toys are as universal as stuffed animals. Stuffies, lovies, plushies … whatever you call them, these soft, comforting toys can be as tiny as a few inches tall, or can tower over kids, stretching upward for foot after foot. Some of these plush toys are simple and affordable, while others are high-tech animated playthings that sing, dance or laugh. Stuffed animals can teach children about the natural world around them or encourage them to dig deep into their creativity to develop their own imaginary world. Stuffed animals aren’t just for play. Having a favorite stuffed animal (or two, or two dozen) is actually beneficial to your child’s development in many ways. From easing separation anxiety to learning social skills through playing pretend, these soft, squeezable toys do it all, often acting as your child’s first friend. Not all stuffed animals are equally cute, cozy, safe or worth their purchase price. It is important for parents, especially parents of infants and toddlers, to be aware of potential safety hazards and to wait to introduce stuffed toys to their child until it is safe to do so. When you first get your child a plush toy, you want it to be cozy and comfortable, especially since stuffed animals can help kids sleep better. What every parent seeking the best stuffed animals for kids should know is that you want to choose a collection that uses high-quality materials and offers enough variety that you can find something that fits your child’s interests and personality. Practical considerations are important, too – like how widely available the plush toy is and whether the value lives up to the price tag. 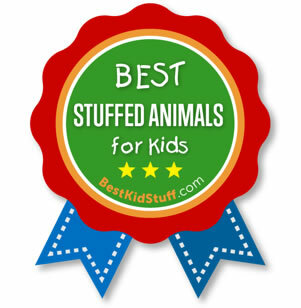 Every option on our best stuffed animals for kids list has been comprehensively evaluated and determined to be among the safest, cutest, most comfortable, best-made and most affordable plush toy choices on the market. Some of the most beloved stuffed toys out there are part of Aurora World’s expansive Flopsies line. Hundreds of different animals come in three sizes: an 8” mini size, the 12” regular size and a 27” long super size. The most popular plush toys in Aurora’s Flopsies lineup, like a Siberian Husky named Shadow, Goldie the Labrador and a plush llama, each have hundreds of positive reviews on Amazon. Other favorites from the Flopsies collection include a moose, a penguin named Penny, a calico cat called Esmeralda and a cat with black and white markings named Oreo, each of which have been praised by hundreds of purchasers. The unique design of Aurora World’s Flopsies stuffed animals – a soft plush body with bean-filled limbs – is what allows them to “flop” for the perfect posable position for cuddling. Their adorable designs with realistic styling and colors, their soft and cozy feel and of course the sheer array of types of animals in the collection mean there’s an ideal Flopsie stuffed toy for every child. An extra soft plush body is ideal for cuddling with, while the bean filling in the limbs allow for the “floppy” positioning that gives these stuffed toys their name. For your child’s safety, bean filling is double-bagged to prevent rips and spills, and the eyes and noses are attached using lock-washers that are more secure than simply sewing them on with a needle. The cute, soft plush toys are recommended for ages three through 15. Available in three sizes, making Flopsies perfect options for travel, cuddling and lounging. The huge variety of Flopsies stuffed animals available includes wild animals, farm animals, marine animals and pets. Prices for the medium and small sizes are reasonable, with 12” toys typically costing around $13.00 and 8” toys costing $6 to $8. Some toys are available in bundle packs that can save the purchaser money, as well. Made by a global company with more than three decades of experience making toys. No batteries needed or mechanisms to malfunction. Not safe for children under age three. The mixed-filling materials might be unwelcome if your child prefers plush toys with a unified stuffing texture. The cost of super Flopsies stuffed animals is high, in the $40 to $50 range. Not machine washable or dryer-safe. The number-one best-selling stuffed animal on Amazon, Flappy the Elephant is no ordinary plush toy. This interactive animated elephant sings, plays peek-a-boo and flaps its ears. The more than 2,330 glowing reviews left by Amazon customers consistently refer to Flappy as one of the cutest toys purchasers have ever seen. It’s no wonder that this toy has won multiple awards in recent years from organizations like Creative Child Magazine and the Tillywig Toy Awards. If you’re looking for a stuffed animal that’s truly something special but doesn’t break the bank – especially for children who love elephants – this is it. Purchasers praised the adorable appearance and interactive features of the toy and found it even better than what they expected. Animated toy speaks, sings and flaps it ears. Interactive games of peek-a-boo are sure to amuse your baby or toddler. The embroidered detailing, in place of plastic or button eyes that could pose a choking hazard, make this toy safe for even the youngest babies. The fun interactive features make it a hit even with toddlers and, purchasers reported, Flappy is likely to make all ages smile. Premium-quality soft polyester plush makes Flappy a cuddly and huggable new friend for your child. Lightweight for even small hands to hold. An alternate version, Flora the Bunny, is also available, though its popularity pales in comparison to that of Flappy the Elephant. Batteries required (trial batteries only included) for animated play. Parents complained of the need for a non-standard tiny screwdriver to open the battery compartment, and some felt that the screws were poor quality and became stripped easily. Pricier than your typical 12” stuffed toy due to its interactive technology. Some purchasers felt that the toy wasn’t as durable as expected, and that seams ripped and mechanical parts stopped working. To kids, there’s no such thing as enough stuffed animals (though parents might beg to differ!). A multi-piece set like Unipak’s Plush Treehouse With Animals is a great buy that gives you more for your money. The 12” plush tree stump is home to five adorable stuffed animals, each measuring 6” to 7” tall: a fox, a chipmunk, a raccoon, a black bear and a bird. The PVC pellets that fill the forest-dwelling animals could pose a choking hazard to the youngest children but are considered safe for the product to be recommended for ages 3 and up. Children find so many ways to play with this toy, with younger users finding fun in taking the animals out of the holes and replacing them again and older children using their imaginations to act out scenarios with the five stuffed animals. At just $29 for the stump and all five stuffed animals, this fun set is a great buy your kids will love. Instead of just one stuffed animal, this set comes with a treehouse “home” for a collection of five adorable plush woodland creatures. A handle attached to the tree stump makes for easy carrying. Measuring at 6” to 7”, the five stuffed animals are a great size for little ones – not too little, but still compact and easy to hold. Both the tree itself and the animals are soft and cuddly, and buyers describe the material for the tree as a “velvety, thick” and sturdy plush fabric. The $29 price point is very reasonable for all six pieces. While the color of the bird can vary, the item is supposed to come with all five of the different woodland animals, but some purchasers received five of the same animal, instead. To some purchasers, the quality and durability – especially of the treehouse – seemed lacking. Because the animals are filled with PVC pellets and the plastic eyes are sewn on, the toy is not recommended for children under three years old. For a stuffed toy that’s really over-the-top, you can’t beat Melissa & Doug’s Jumbo line of lifelike plush animals. Ranging from nearly 2’ to more than 4’ tall, these stuffed toys are as huggable as they are massive. The most popular animal in the collection is the giant giraffe, which has more than 1,660 positive customer reviews. Other favorites among the dozens of different animals represented include the giant sea turtle, the giant shark and the giant golden retriever. These beautiful stuffed animals are made to last, handcrafted out of a wire frame that allows it to stand on its own and covered with a soft polyester fabric. Children and adults alike love dressing the giraffe up and “playing pretend” with the huge stuffed animal, so despite being a low-tech toy, it is great for nurturing creativity. These giant stuffed animals are a definite statement piece, with the largest animals measuring over 4’ tall. Your kid’s bedroom or playroom will never look the same again! With dozens of different animals in the jumbo lineup, ranging from zoo animals to marine life to pets and even fantasy creatures, you are sure to find an option that fits your kid’s interests perfectly. Intended for ages 3 and up, but it’s clear from the customer reviews, and especially customer images of the product, that grownups are having as much fun with this giant stuffed animal as the kids are. These jumbo stuffed toys are handcrafted with quality materials that include a soft polyester surface fabric and a wire frame construction for the legs. The responsive seller stands behind its product with a 100 percent guarantee, and some purchasers who originally posted negative reviews updated their feedback, praising Melissa & Doug’s customer service. Made by a company with more than three decades of experience crafting toys meant to stimulate imagination and creativity. For most models, no batteries needed or mechanisms to malfunction. Some purchasers found that the jumbo stuffed toy they received did not stand very stably on their own and needed to be propped up or supported. While the stuffed toys are big enough to tempt children to ride them, they aren’t meant to be rocking horses. The manufacturer expressed that the stuffed toy is not intended to hold a kid’s weight. Some buyers reported that the giraffe did not hold up under the strain of rough play. The size and metal construction of the stuffed toy makes it less than ideal for bedtime snuggling, which to some purchasers, made it a toy of a more decorative nature compared to a traditional stuffed animal. The large size may be difficult to accommodate in small homes and doesn’t make for a travel-friendly toy. Naturally, the price tag on these giant stuffed toys is higher than your average teddy bear. The largest animals in the collection have a list price of $99.99 on the manufacturer’s website, though Amazon offers some discounted prices. The smallest stuffed animals in the jumbo lineup cost in the $15 to $30 range. There’s no stuffed toy more classic than a teddy bear. It’s hard to imagine anyone more qualified to perfect this stuffed toy archetype than GUND, a toy company with more than 120 years of experience. Among the best-selling and consistently highest rated of these plush toys is the GUND Slumbers Teddy Bear. The 17” bear is the perfect size for little ones to sleep with, and buyers had reported that even adults loved the comfort of this big, soft classic stuffed toy. Your child will love the premium-quality soft and silky plush, the detailed coloring and paw pads and the huggable, squeezable filling. If Slumbers doesn’t seem quite up your kid’s alley, GUND makes dozens of other teddy bears that might be. The Toothpick Teddy Bear has the same huggable softness and quality, but his toothpick-thin limbs put a unique twist on the expected bear shape. The Philbin Teddy Bear, available in three sizes ranging from 12” to 29” tall, is another fan favorite. If you’re looking for an interactive stuffed toy, check out the GUND Peek-A-Boo Teddy Bear Animated Stuffed Animal, with an attached blanket that can be personalized with your child’s name. Soft, huggable stuffed toys that easily become well-loved friends and companions of children ages one to five. Even adults reported loving their GUND bears! In hundreds of positive reviews for each different bear in the GUND collection, customers consistently describe the bear as well-made and the materials as high-quality. Numerous styles of teddy bears to choose from, each with different markings, coloring, sizes, features and designs. Made by a well-established and trusted toy company with more than 120 years of experience. Some interactive options available if you’re looking for something more from your child’s plush toy. Larger-sized bears are somewhat pricy, with the 29” Philbin teddy bear retailing for $74. Most GUND bears are simple stuffed animals, without the fancy animated mechanisms or mixed-filling materials design found in some of the other plush toys on our top 10 best stuffed animals for kids list. There’s just something about elephants that makes them irresistibly cute to kids and adults alike. The perfect elephant for your little one is the Lil Benny Phant by Aurora World. Sitting 9” tall and wearing an expression consistently described as “endearing” on its adorable little face, this simple stuffed toy has become one of the best-selling plush animals on Amazon. More than 960 purchasers have written positive reviews of this little elephant, eager to share how their children squealed and screamed with delight upon seeing the charming toy. Adults, too, praised the elephant for helping them cope with stress and anxiety. A buttery-soft fabric exterior surrounding squeezable plush filling makes this elephant the perfect toy to stroke, hug and cuddle. Available in gray, mint green, pink and blue, there’s an option to please every kid. At 9” high in its seated position, Benny lives up to his “Little” name but is still big enough to snuggle and hug. Mixed fabrics add dimension and interest to the look of the plush toy. Purchasers and the children who received the stuffed toy raved about the lovable look on the elephant’s face. Recommended for ages three to 15, but as the customer reviews prove, people of all ages love the item. In the $10 to $15 ballpark, the item fits into a moderate price point. Not intended to be machine washable or dryer-safe, though some purchasers put the toy in the washing machine anyway. Though adorable, this simple stuffed animal is not as flashy or fancy as the animated, interactive toys on the list. Because the eyes are plastic and could be chewed or ripped off, the snuggly little toy is not recommended for use by children under three years of age, even though they often show an interest in it. Some purchasers reported issues with the quality of the stuffed animal they received, such as eyes that are off-center or poorly stitched seams on the trunk, though many more buyers were pleased with the quality. For Wild Republic, creating stuffed toys that represent an array of animal species isn’t just a coincidence or a marketing choice. For 40+ years, the Ohio-based international company has focused on producing nature-related toys, gifts and souvenirs with the intention of getting children interested in learning about the real-life versions of the animals. While you can buy Wild Republic stuffed toys from stores and online retailers like Amazon, they’re often found in the gift shops at zoos and aquariums. Among the more than 660 stuffed animals produced by Wild Republic, the Cuddlekin Three-Toed Sloth is perhaps the most widely loved, having garnered glowing reviews from more than 1,470 happy customers, though the larger Jumbo Wolf Plush has more than 950 positive customer reviews, as well. To better serve the company’s mission of educating children, the animals have realistic detailing in their paws, claws and markings. Buyers reported that the high-quality synthetic polyester fiber was soft and the filling appealingly squeezable, though some body parts of some animals are filled with pellets to add weight and make the stuffed toys more lifelike. Realistic detailing is not just aesthetically pleasing but also educational, so that your children can learn about animals as they play. Wild Republic makes hundreds of different stuffed toys that represent different animals and come in 5”, 8”, 12”, 15”, 25” and 30” sizes, so your options from this longstanding toy brand are almost endless. In case you’re afraid that the toys are educational only, you should know that customers love the super soft plush and filling soft enough to comfortably use the larger stuffed toys as pillows. Prices are surprisingly reasonable, with list prices on Wild Republic’s website of $5.99 for 5”, $9.99 for 8” and $16.99 for 12” toys. The priciest stuffed toys are the massive 30” ones, listed at $59.99. Though intended to be durable, numerous Amazon reviews complain of the stuffed toys “shedding” hair or fur with even light use. Some buyers reported poor stitching on the stuffed animal they had received, which calls into question the company’s quality control. Many purchasers found the hair on their stuffed toy to be almost “sticky” with glue marks, sometimes collecting debris that you would not want your child exposed to and requiring a good brush before giving it to a child. If the name sounds familiar, it’s because you might know it as a toy not related to stuffed animals at all. Fingerlings started out as interactive baby animals made of plastic that were just the size to fit on a child’s fingers. These tiny toys were all the rage during the 2017 holiday season, but now, manufacturer WowWee is onto bigger things: Fingerlings Hugs, the much larger animated stuffed toys with arms the perfect size to give real hugs. These exciting animated toys will respond to your child’s motions, sounds and touches. Tickle them, throw them, hug them, bring them in for a kiss – there’s no shortage of ways for your kid to play with this interactive plush toy. A particularly fun addition to the Hugs version of the Fingerlings toys is the ability to record your own sounds and remix them. Create your own special message for your child, or help your child record his or her voice. The many different interactive functions make this animated toy more unique and exciting than others that have more limited functions. Available in four styles: Bella the pink monkey, Boris the blue monkey, Kiki the purple glitter monkey and Gigi the white unicorn. The interactive toy is engaging enough to be suitable for children ages three to 15. One set of batteries included so your child can start enjoying his or her Fingerlings Hug right away. An instructional video available for free online shows how to play with the Fingerling Hugs. Most purchasers found the Fingerlings Hugs cute and their tricks charming and reported that their children loved the toy. Some buyers reported that it was difficult for their children to figure out how to get the animated toys to work as intended and to make all of the sounds advertised. Like other animated stuffed animals, there are more complex components to this toy that could malfunction. Some purchasers reported having trouble getting the toy to turn on or off properly. Batteries required for animated play. Some purchasers disliked the battery cover, which requires a non-standard small screwdriver to open. A noisy toy with no volume control. EpidKids specializes in creating organization tools, like toy hammocks and car backseat organizers, that make life with kids easier for busy parents. You might be surprised to find that its stuffed penguin, Mr. Chil, is one of the most raved-about stuffed animals on the market. Mr. Chil has more than 320 glowing reviews on Amazon, but there’s also a Mrs. Chil, with more than 170 positive reviews of its own. Why do people love this little penguin so much? It’s 5” size makes it a great take-along companion, whether for a quick trip to the store or a long ride in the car. You can’t help but smile when you see the sweet and joyful expression on this penguin’s cute face. The soft, perfectly huggable plush construction makes Mr. Chil an instant hit. The stuffed toy is safe for children as young as six months of age. “Super cute” is the phrase many buyers chose to use to describe the appearance of Mr. and Mrs. Chil. The stuffed toy’s facial expression really hits the mark, with a smile that goes beyond its beaked mouth and extends to its eyes. The 5” size allows even the youngest children to carry the penguin around without much trouble. Unlike the many jumbo-sized stuffed toys on the list, it won’t take up much space in your home (or, on the go, in your car, shopping cart or restaurant table). Made without choking hazards like beads and buttons, even babies as young as six months old can enjoy this toy without mom and dad having to worry. The $10 price point ($16 list price) on Amazon is low compared to other stuffed toys on the list, but somewhat high for such a small plush toy. Some buyers were displeased with the stitching quality, citing issues such as seams ripping, stuffing coming out or the item not looking like the images online, which suggests that quality control could be a concern. For some purchasers, the tiny size was too small for their liking. Does any kid not go through a dinosaur phase? This 11” stuffed toy by GUND is no terrible lizard, but instead an adorable baby himself, suitable for the youngest dino-enthusiasts out there. Ugg’s light green body is decorated with soft blue spots and orange scales, and the pleasant face of this newly hatched dinosaur is carefully embroidered, so there are no eyes to pose a choking risk even for newborn babies. Another highlight of Ugg is its easy-to-clean nature – just toss him in the washing machine when he gets dirty. More than 200 buyers who reviewed the stuffed toy on Amazon had wonderful things to say about its softness, its adorable look and how much their children enjoyed it. Numerous publications included Ugg at or near the top of their own stuffed animal rankings lists in recent years. The only problem? GUND has discontinued making the beloved stuffed toy, so Ugg and his friends, Orgh the purple stegosaurus and Crom the orange T-Rex, are becoming scarce commodities. Ugg and company are out-of-stock at many retailers that once sold them, like Walmart and Sears, and the shortage has made the cost on Amazon, where the stuffed toys are still sold, creep up to the $38 price point – not the most outrageous, but certainly high for a modestly-sized plush toy without much in the way of bells and whistles. If you can’t justify the cost, take a look instead at GUND’s newest dinosaur collection, which includes Chomper the 15” green T-Rex, Tailspin the 18” red stegosaurus or Charger the 20” triceratops. If you’re looking to buy a stuffed toy for your dino-loving newborn, the GUND My Dino Adventure Stuffed Plush Playset is appropriate even for age 0. Adorable dinosaur design appeals to all ages. With no sewn-on eyes or other features, Ugg is free of choking hazards and safe even for newborns to play (but not sleep) with. Wildly popular with customers and reviewers. Machine-washable construction makes a parent’s life easier, because even the biggest messes your little one can make won’t ruin the toy. Lack of easy availability means that Ugg is harder to find than he once was. The price currently listed on Amazon is more than double its modest original cost. The plush toys found in both the GUND Baby dinosaur series starring Ugg and the new dinosaur collection are simple, without the fancy animated mechanisms or mixed-filling materials design found in some of the other plush toys on our top 10 best stuffed animals for kids list.